Mt Colah Mt Kuring-gai Scout Group have achieved so much thanks to the dedication and commitment of our Youth members, our Leaders, our Committee, and our families. The Jamboree has to be one of the highlights of 2009/2010. This year has been particularly good as it has been one of the largest contingents we have been able to send in recent times. The impending Cuboree will surely be another highlight. The actual construction of our new Scout Hall and near completion before year end would most definitely be the biggest highlight. For Greg, Peter and other Hall Reconstruction Members, past and present, will no doubt breathe a major sigh of relief as they pinch themselves and put the headache to bed, and hopefully begin to actually enjoy the dream, now a reality, of our new hall. After 6 years of frustrations and red tape they, and the Leaders, deserve to be congratulated for not giving up when the going got tough and the light at the end of the tunnel was barely visible. On behalf of all the youth members and families who believe in the scouting movement, we thank you. Of course it would be remiss of us not to thank Asquith and Berowra Scout Groups who have long supported us in our time of homelessness. Who knows where we would’ve been without their generosity. It’s been a positive outcome for the once defunct Berowra Vennies, who under our influence, are once again a strong unit combined with Mt Colah. It will be hard to go their separate ways in the new year. We must also thank Hornsby Gang Show for allowing the Scouts and Venturers to use their premises at Hornsby South in our hour of need back in 2004 – 2007. There are many people that have made this year as successful in Scouting terms as it has been. Foremost amongst these are the Leaders, who selflessly donate their time to the development of the future of our society. Secondly, there are the Committee Members who also donate a great deal of their time to this worthy cause. Ultimately, all these excellent men and women are in turn supported by their wonderful partners and families, who give them the freedom to contribute so much of their time. A special mention and thanks must go to Greg McKinnon, Group Leader, for his tireless efforts into bringing the construction of our hall to fruition and a reality. Everyone’s voluntary contributions exemplify the best of being Australian. Cub Leader, Gary Binskin, has also moved on…but not very far. As he steps out of Akela’s shoes and welcomes Jeff Argent to fill them, he moves to scouts as …. 2011 will see Mt Colah Mt Kuring Gai full of enthusiasm as we consolidate our dispersed sections back to a cohesive, cross-supporting Group, in turn allowing us to provide even higher quality programs for our youth members. Embrace yourselves for the wave of excitement yet to come. As always. Greg McKinnon(Wombat) is always available to be contacted at any time for discussion on any subject, especially on ideas on how you can contribute to youth development in your society. Mt Colah / Mt Kuring Gai Rover crew is an ever growing, ever changing crew that in recent months have challenged each other to get the most out of what Rovers has to offer. The year started off smoothly as we organised ourselves for Roventure. Once again this was a great weekend interacting with the Venturers which we believe proved to be a success. 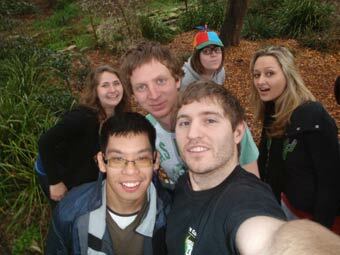 In March the crew attended the very amusing Seuss Moot held at Kuring-Gai camp. In the month of April we proudly attended the ANZAC Dawn Service at Hornsby RSL and served breakfast to patrons. This month also saw us attend Tanks Hike organised by two of our crew members Tom and Josef. 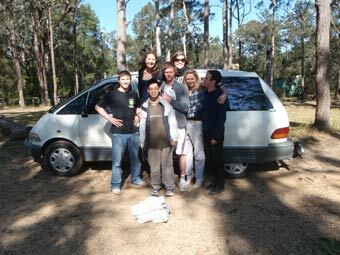 The overnight hike was held at Tanks in the Hawkesbury where we were gladly joined by some of Normo and Epping Rovers. Upon organising the trip Tom and Josef were able to complete their squiring. In the colder months we attended Region Service (bush regeneration ) at Curl Curl beach, Mud Bash, Hornsby Gang Show performances, Hornsby District Camp at Binskin’s farm and Not a Moot at Myrall River state forest which Tom Hickman solely won the camp in which McMk Rovers will be running “Not a Moot 2012”. Normanhurst’s Magical Mystery Tour 2010 Myths and Legends, is one of the year’s most highly anticipated event in our annual calendar. This year organised a ‘magical’ van to take on the Mythical journey to an unknown destination deep in the forest just out of Kangaroo Valley. Throughout the day we stopped at activity check points and answered questions along our future paths. Although we did not win, the night was still full of celebrations and dancing. The Hornsby District Camp consisted of Mc/Mk, Normanhurst and Berowra Rovers where we camped for a week at Binskin’s farm on Mitchell’s Island near Taree. Rovers took up their Mud Bash Cars/Motor Bikes and made a racing course which was the highlight of the week. Hornsby Gang Show 2010 was a great big success and especially since most of our Rovers are in cast and or involved behind the scenes. This year was Andrew Chan’s first year in the show and he enjoyed himself tremendously learning new skills and making lifelong friends. He encourages all Cubs, Scouts, Ventures and Rovers to see the 2011 show as well as 11 year old plus members to Audition for 2011. Auditions will be early December 2010. Go to http://www.gangshow.com for more information and to grab your application form. We have recently collected cans for the annual Wesley Mission Hike for Hunger, a state wide project instigated by Rovers to support the Wesley Mission’s Homeless Kids Outreach Program. Our crew, letter- box dropped notices, and in the following weeks stopped by to collect can donations. One night we were happily joined by Mt Colah and Berowra Ventures who helped out with the collection. We now have over 1040 cans that will be presented to Wesley Mission on the 6th of November. Rovers from Sydney’s north side first initiated the Hike for Hunger in 1999 and it now forms an important part of the NSW Rover’s service program. To celebrate the Hike for Hunger’s 10th anniversary in 2009, NSW Rovers set out to collect 10,000 items. This goal was surpassed, with over 11,000 items being collected. Our next event will be *C*R*A*P* ON FIRE! (Christmas Region Annual Party) to be held at our much awaited new Mt Colah/Mt Kuring -Gai Scout Hall, which we have been attending working bee’s to see its completion in time. 2011 will sadly see’s both David Blakeley and Chris Whitfield turn of age and be booted midyear. The crew will then be lead by Tom Hickman who is now in training to become crew leader, as well as Josef Urmenyhazi as assistant CL. Mc/Mk’s next step is to witness a long awaited new hall be completed so we can finally call somewhere home.